Concert Etude op.49 (orch. Gene Mullins; harp (Marjorie Tyre)) [3:11]. rec. Hannover, Germany, 16-18 September 2011, 23-25 May 2012. This CD is a real treat - a little box of absolute delights with a vivid power to surprise. The first and longest work on the disc is by a composer who the booklet notes say is not even listed in any music lexicon. That’s unfathomable especially after hearing this concerto. It is one of those compositions that fool you into thinking you’ve heard it before when clearly you can’t have as this is a world première recording. A violin pupil at the Moscow Conservatory Music School, Ilya Shakhov volunteered, aged 16, to help defend the capital when the Second World War came to its gates. He only started composing after the war. This concerto dates from 1955 and is an important and valuable contribution to Soviet trumpet repertoire. The concerto abounds in lovely joyous themes and the main melody is particularly gorgeous. Romantic is certainly the correct description for this concerto. The soloist is involved right from the start. Reinhold Friedrich has a wonderfully rich and clear tone and every note is true. The next work is surely the best known of all works for trumpet to have been written in Soviet times. The title of the disc should really have been Soviet Trumpet Concertos since Arutiunian, who died this year only six months short of his 92nd birthday, was Armenian, born in Yerevan in September 1920. This concerto was intended to be written in 1943 for the principal trumpet of the Yerevan Philharmonic Orchestra, Zsolak Vartasarian but he died during the war. The work was only completed in 1950 and premièred by Aykaz Messlayan, though it was Timofei Dokshitzer whose recording brought it to world attention. Since then it has become a firm favourite. Right from the beginning it uses traditional folk melodies from his native land imparting an attractive oriental flavour. Arutiunian clearly favoured the trumpet as a solo instrument and he composed several works for it. Oskar Böhme was another composer whose attachment to the trumpet resulted in several works for the instrument including the only known concerto for trumpet and orchestra that was composed during the romantic period. This work helped to establish his career in his adopted country of Russia to which he emigrated in 1897 from his native Germany. His short work La Napolitaine, a tarantella, written in 1900, is full of exuberance and joie de vivre. It became extremely popular with its evocation of Southern Italy through its allusion to a folk dance. Sergei Vasilenko’s concerto, subtitled Concert-Poem is a highly attractive work that was another valuable addition to Soviet trumpet repertoire. Written in 1945 its three movements contain rich themes which emphasise the trumpet’s gentle side. Other music by Vasilenko on Toccata and Marco Polo has been reviewed on Musicweb. 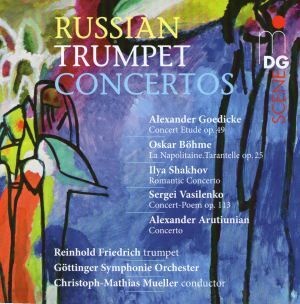 Considered as a founder of the Russian organ school, Alexander Goedicke wrote several works for trumpet (see review of a concerto) including this highly virtuosic piece . It calls for much double-tonguing, a challenge for any trumpeter but which Reinhold Friedrich finds no trouble at all. A Conzertstück for piano and orchestra by Goedicke featured on a early Romantic Piano Concertos release by Hyperion. This is an interesting disc presenting rarely heard repertoire and played by a true lion of the trumpet. His sound is absolutely pure presenting these works in their finest light. He is complemented by a great orchestra that serves its soloist wonderfully well.